I'll admit it: I love my minivan. As long as it's considered for the function of transportation instead of the excitement of driving, there's nothing it can't do. It doesn't skimp on conveniences either, which include smart keys and power sliding doors. However, there's a literally unpressable button in that mix. The idea of a smart key is that it can be in a pocket or bag, and you never have to touch it. To allow you to lock the car without having to find the key, there are "lock" buttons on the outside door handles. The problem is that you can't use the lock buttons until all the doors are closed - so the convenient-but-slow sliding doors force me to wait by the car so I can press the lock button after they close. 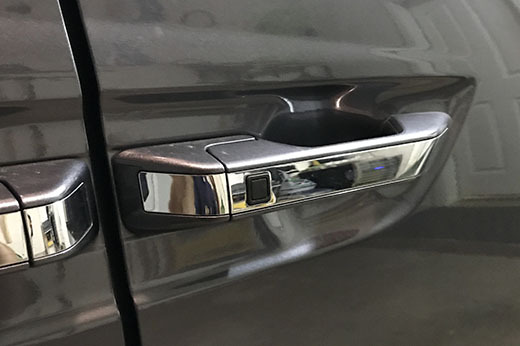 A simple change seems feasible, where the car could beep to acknowledge the lock button with the doors open, then double-beep when the doors close and successfully execute the lock command. It'd save a few seconds every time, often many times per day, and that adds up. Making buttons more pressable can make smart keys smarter!